VBS Direct Ltd - VBS Calming Liquid - Innovative solutions for the veterinary professional. 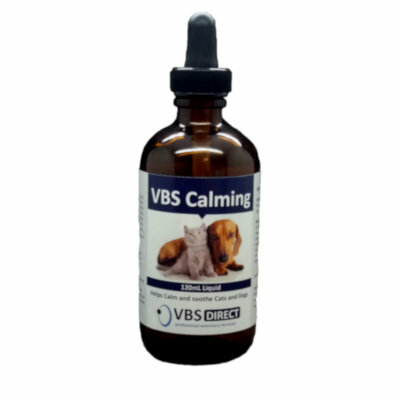 Designed to calm and soothe, VBS Calming Liquid is an innovative, salmon flavoured formula for small dogs and cats exhibiting nervousness, anxiety or aggression. Use for acute or chronic stress and disorders such as separation anxiety, neurogenic diarrheoa and neurogenic dermatitis. Features pharmaceutical-grade L-tryptophan, an essential amino acid that is converted to serotonin in thebrain, L-Theanine which is converted to GABA and Vit B3, natural Valerian Root which matches the same calming neurotransmitter receptors as benzodiazepines but with very low toxicity and Ashwaganda, an adaptogen to help the adrenalglands combat stress and relax naturally, effectively and safely. True, cat-friendly formula due to the salmon flavour. Shake well before use. The product comes with an enclosed measured dropper pipette to ensure easy, safe and accurate dosing. Do not use in conjunction with CNS depressants, prior to anaesthesia or with hepatotoxic drugs.